The Namtso Lake is held as “the heavenly lake” or “the holy lake” in northern Tibet. Lying at the foot of Nyainqentanglha Mountain, it covers an area of 1,940 square kilometers at an elevation of 4,718 meters. or 15,479 ft! It is believed to be the largest saltwater lake in Tibet and at the highest elevation in the world. Pretty amazing feeling! there are some beautiful monasteries in Tibet. Make sure to get these monasteries in on your trip. We had a wonderful guide Norbu who had in-depth knowledge about everything we asked. She was very flexible and we could do things at leisure… There was a general itinerary we had and did it our own pace. 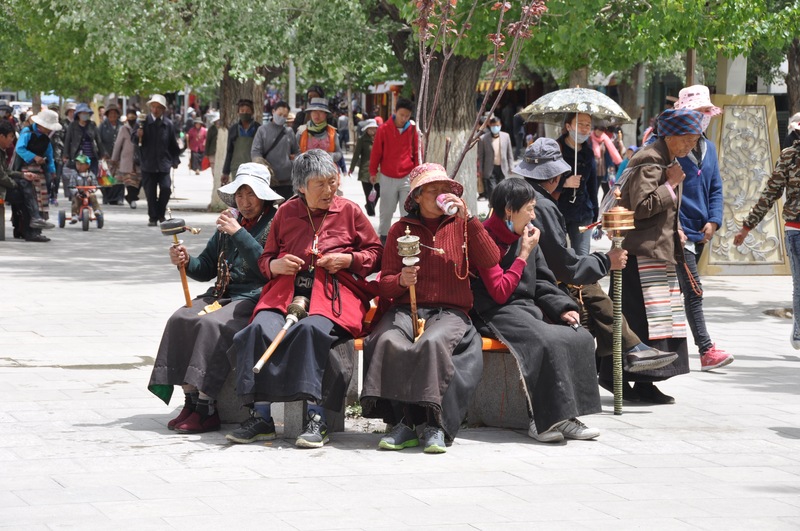 Tibetan Women with their Prayer Wheels and Prayer Beads.